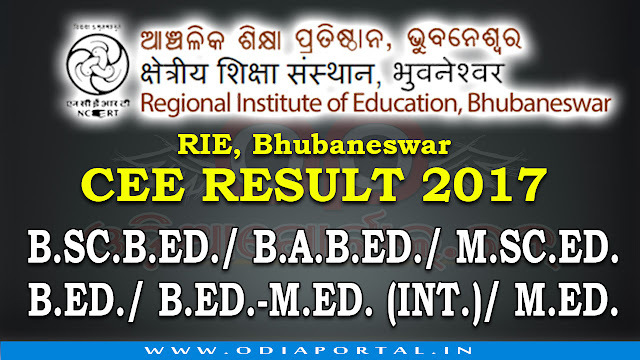 Regional Institute of Education, Bhubaneswar is going to announce NCERT CEE (Common Entrance Examination) Result 2017 for B.SC.B.ED./B.A.B.ED./M.SC.ED. on 10th July, 2017 & 24th July, 2017. The Regional Institute of Education, Bhubaneswar is a constituent unit of National Council of Educational Research and Training (NCERT), New Delhi. The NCERT was set up by Government of India in 1961 as an autonomous organization registered under Societies Registration Act (Act XXI of 1860) to advise and assist the Ministry of Human Resource Development (MHRD), Govt. of India and Departments of Education in States and Union Territories in formulation and implementation of their policies and programmes in the field of Education. Candidates who were appeared in their exam last month, they are advised to check their CEE 2017 result by Log in to there Online Application Account at RIE Mysore Official Website. After successful login they will see their result sheet on webpage.